← A Critical Analysis of a Study of Essential Oils and Apipuncture—Oh, Forget It, This is Just Ridiculous…. Yet another systematic review of veterinary homeopathy has just been published, bringing the total to six. I have discussed several of these before (e.g. 1, 2). They have consistently failed to find high-quality research evidence to support homeopathy in animals, despite the fact that the previous reviews have been conducted by advocates for homeopathy. Most of the studies identified fail even basic methodological criteria for reliability, and there is a lack of consistency and reproducibility to any positive findings. So while there are individual studies that appear to show homeopathy having some effect, a comprehensive review of the evidence at all levels fails to support any specific use. And while this failure might not be damning for a new therapeutic approach, after more than 150 years, it is past time that a truly effective therapy should have been able to prove its worth. The same conclusion has been reached by many others, from the systematic reviews of homeopathic trials and systematic reviews of these systematic reviews, to the formal investigations of governmental agencies such as the British House of Commons Science and Technology Committee and the Australian National Health and Medical research Council. While homeopaths have had more than a century to try, they have not been able to produce a body of scientific evidence to convince anyone but themselves that homeopathy works. Frequently there is poor reporting of study details, so it is not possible to accurately assess the risk of bias (this, sadly, is a general problem in the veterinary literature, not just in the domain of alternative medicine). Studies with better control for bias are less likely to show positive results. Studies published in dedicated alternative medicine journals are more likely to show positive results than those in the mainstream scientific literature, suggesting publication bias. Positive studies are not replicated. This is key since no single study can prove any hypothesis, much less one as inherently dubious as those behind homeopathy. Consistent findings by different researchers in different settings is required to have confidence in positive effects of a treatment. The authors made perhaps the most comprehensive search of the livestock literature yet for homeopathy studies. Their goal was to identify any study of homeopathy used in farm animals in a way that might reduce or replace antibiotics, either in the prevention or treatment of infectious diseases or as a growth promoter. Since this is a common use claimed for homeopathy, this is a relevant subject within the larger literature. From 1981-2014, they found 48 published studies that fit their search criteria. Only 11 of these were double-blinded randomized controlled trials, the best kind of study to evaluate medical treatments. The trials included had a variety of shortcomings. 39 of the studies were considered to have a significant risk of bias based on how they were conducted. Many also included only very small numbers of patients. Some selected a conventional treatment for comparison that did not meet current guidelines or standards for selecting antibiotic treatment, which would have been a misleading comparison. 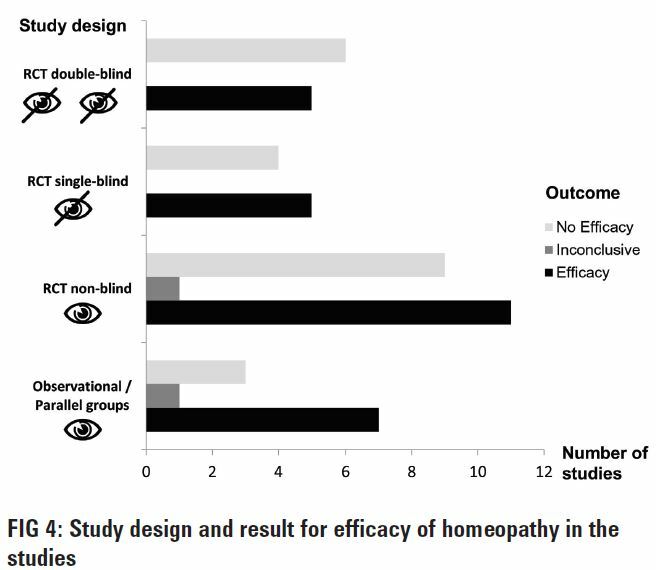 Homeopathic trials performed as a single-blind or non-blind RCT, parallel groups or an observational trial (Fig 4) tended to be more frequently efficacious than a double-blind RCT, indicating that positive outcomes may partly be due to a bias caused by a conscious or unconscious preference for a certain treatment. Altogether, studies with a high possible risk of bias were more prone to report efficacy of homeopathy than studies with a low risk of bias (OR 1.71, 95 per cent CI 0.48 to 6.11, P=0.41 vs OR 0.58, 95 per cent CI 0.16 to 2.09). In journals focusing on alternative treatments, 15 of 18 trials reported that the homeopathic remedy tested was effective (odds ratio [OR] 3.75, 95 per cent confidence interval [CI] 0.63 to 22.04, P=0.14), while in journals with a broader focus on veterinary medicine, 12 out of 18 trials found the homeopathic treatment was ineffective (OR 0.27, 95 per cent CI 0.05 to 1.57). When taking the total number of studies into account, not even one study was repeated under comparable conditions. Consequently, the existing conditions, which enable a systematic review to be carried out completely are not given. The current evidence of studies providing evidence in favour of homeopathy lacks reproducibility and therefore cannot claim to have sufficient prognostic validity. This review reinforces the conclusions of previous reviews. Despite 150 years of effort, no reliable, high-quality evidence has been produced showing homeopathy to be consistently effective for any veterinary use. Added to the inherent inconsistency of homeopathic theories with established scientific principles, and the much more rapid and dramatic validation many other treatments have been able to achieve, it is past time to accept that this practice has no value beyond placebo and is inherently a waste of resources and misleading to animal owners. 4 Responses to Another Systematic Review of Homeopathy and–Wait for It– Still No Good Evidence It Works! Of course early, small studies create inflated effects for all subjects, not just homeopathy. The difference is that over time, more and better studies are done and the real effect is identified. If it is significant, the therapy is accepted, and if not then the therapy is abandoned. With homeopathy, over 100 years of research has failed to generate consistent, meaningful, repeatable results yet true believers refuse to accept the data and abandon the practice. Well but I guess I’m still confused then why about half of the “higher quality”studies DO show an effect.. it seems like if it were so clear that it is just “magic water,” the higher quality studies would be much more consistent in showing NO effect? Actually, the better the control for bias, the less likely an effect is to be seen. This has been found in numerous systematic reviews of homeopathy research. The fact is that when new ideas in medicine are correct, however unlikely they seem at first glance, they are rapidly proven true and adopted. The folks who proposed duodenal ulcers might be due to a bacterial infection rather than stress were widely ridiculed at first. A couple of decades later they were awarded a Nobel Prize. Homeopathy has been trying to prove itself for over 150 years and has not been able to generate convincing, high-quality evidence that it does anything at all. Further study simply isn’t justified.